A Nativity Themed Fireplace Mantel. Very simple but beautiful! With the temperatures below zero today, I'm extra glad to have my fireplace. I love to sit in front of it with my comfy chair and a good book, and just while away the evening. But it makes me even happier to sit there today as I enjoy the tree on one side of my living room, and this beautiful nativity themed Christmas mantel on the other. I started by having Walgreens print me a picture of the Kneeling Santa that I found here. The picture is a little grainy up close, but I think it adds to the rustic charm of the picture. 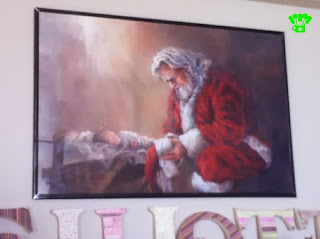 It's just so beautiful and reminds me not to forget the true meaning of Christmas this season. 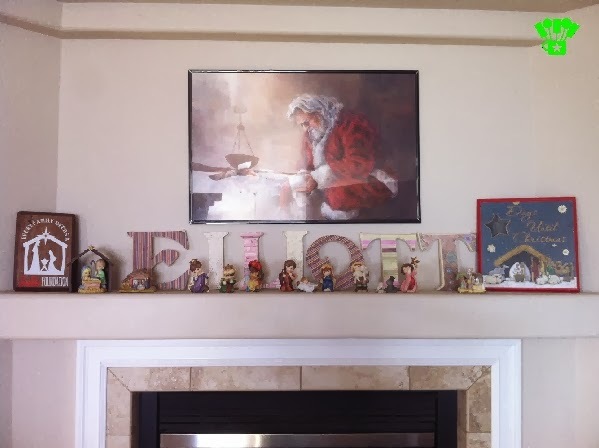 With our Elliott sign in the center as always, I added the few nativity scenes that I own around the edge of the fireplace mantel. On the left side is a wooden plaque that my sister made for us last year for Christmas. 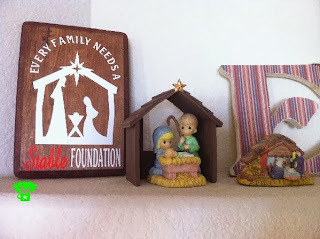 It says "Every Family Needs a Stable Foundation". The Precious Moments nativity scene next to it was actually bought as a gift many years ago. After carrying it around for five years, I decided to just keep it since it was so sweet. 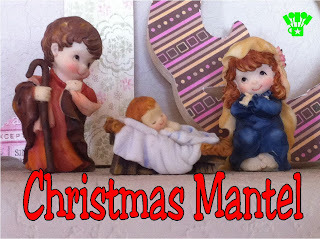 The small scene on the end is one that I received my first year of College when my mother did the 12 Days of Christmas for me. 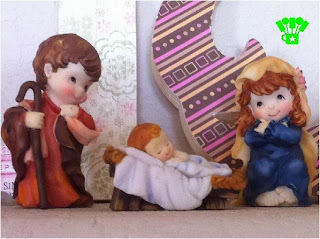 The center nativity is a full set featuring kids acting out the nativity scene. I just love how cute they are. On the right side of the mantel is a Chalkboard advent calendar with the nativity scene on the bottom. My sister also made this with her Vinyl business to sell a few years ago at our Christmas craft show. 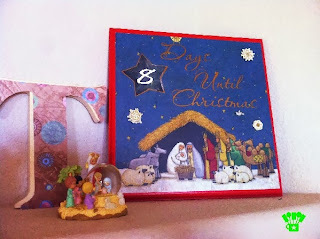 She had a few left over, so I quickly snatched it up for my advent calendar collection. 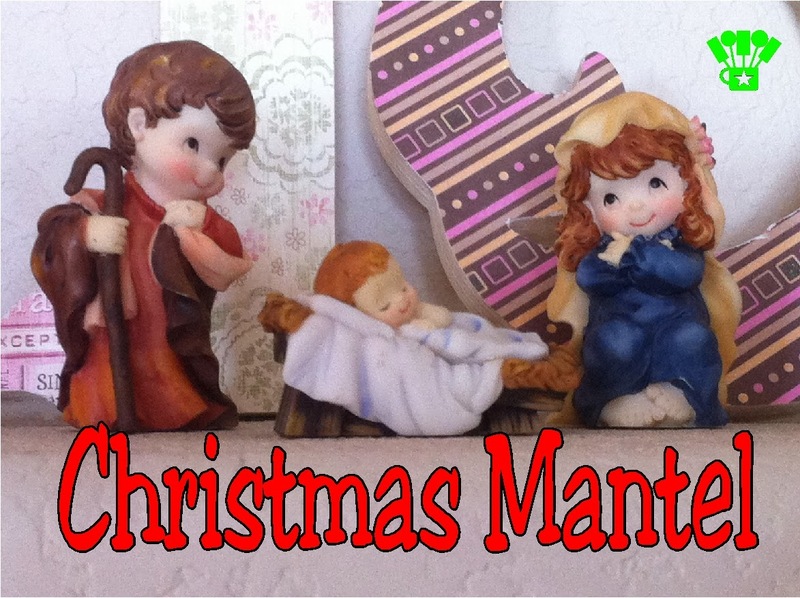 The snow globe nativity scene finishes out the Christmas mantel. It's the only snow globe I have left after collecting them for 10 years and so makes me smile when I see it. We normally hang our Christmas stockings on the mantel, but I'm afraid of them hanging when we have fires so often, so I'll probably wait to hang them up on Christmas eve. 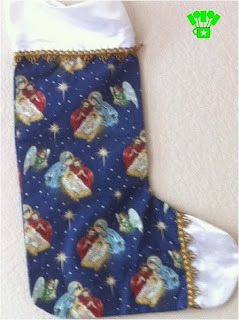 We have a special stocking for Jesus where the kids give Jesus gifts through the season by doing small acts of service for others and then writing them down and placing it in the stocking. On Christmas morning we open the stocking first and read all the things that we've done to celebrate the birth of Christ. I have this stocking hanging by the front door so we can all add our gifts through the season.